Learn French Online with French Faster, an online French language school specialising in Français Langue Étrangère. Take our online French lessons anywhere, anytime - 24 hours a day, 7 days a week! See how it works. Learn French Fast using our Accelerated Learning method that helps you learn French through English. Read the Testimonials and success stories of our students who are very satisfied with our online French tutors. Discover how we make learning French easy and fun, especially French grammar! French Faster has a dynamic team of qualified French language tutors. They are all native French speakers based in different parts of the world, allowing us to deliver a range of French courses 24 hours a day, 7 days a week. They undergo a very rigorous training on our Accelerated Learning method, teaching French as a Foreign Language (Français Langue Etrangère, FLE), and teaching French through English. For the teachers, this means learning to teach every single topic in the easiest and most effective way. For the students, this means not being guinea pigs in the hands of inexperienced teachers, thereby saving them Time, Effort and Money. I was so happy that I found French Faster when searching for French tuition for my child. It is so convenient, he doesn't need to go anywhere. Starting from scratch, he is now able to understand some of the French words and common phrases. The teacher is so patient and understanding with my son who likes her very much. During lessons, she'll speak in French and type the words for better understanding. The lesson notes have very nice illustrations. I highly recommend French Faster. Hopeless and helpless ... I had nowhere to turn but to try the unknown: French Faster Skype lessons. I thought to myself, it is a win or a loose but I had to risk it. It took me ONLY 18 hours of French to achieve A1 in Oral Comprehension and A2 in Oral Expression in the TEFAQ exam. I am extremely happy with my result.The teaching strategies were exceptional! There aren't enough words to express how thankful I am to French Faster. The overall service was excellent. Simone Bailey, TEFAQ preparation course, Jamaica. 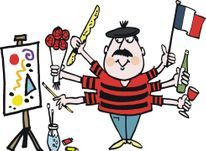 Check out some of our articles on learning French and interesting facts about France. How long does it take to learn French from scratch? French Faster provides online preparation classes for the DELF (A1, A2, B1, B2) and DALF exams (C1 and C2). French Essay Writing Service. Hire a French essay writer online to write your essay from scratch. Buy a French essay online now! Cheap, Reliable and Fast. Do you need help with your French homework? Are you struggling to turn in a French essay on short notice? Try our French Essay writing service. Our French essay writers can help to write, edit, proofread, correct or mark your essay.